Update: Amazon just updated my cookbook page to say Available on January 6, 2018 instead of temporarily out of stock. So all of those who have been patiently waiting should be receiving your cookbooks soon!!! First of all, a big THANK YOU to all of my readers. All copies of the first printing of my cookbook sold out in 19 days. NINETEEN DAYS?! I still can’t believe it, and I am so very grateful for your support. When my publisher saw the huge demand for the book, they immediately ordered a second printing with twice as many books to sell. This printing arrived at Amazon’s main warehouse around the 12th of December. Ever since then, we’ve been waiting for Amazon and other book sellers to process the cookbooks and enter them into their system. My publisher has been following up with Amazon trying to figure out how to get things shipping, but the truth is that we just don’t know how long it will take or whether the books will ship in time for Christmas. I am so sorry it’s taking so long. I have heard from so many of you who are interested in getting a copy of the cookbook, and I’m frustrated too. It just drives me crazy that I can’t get them to you. Please know that we are doing everything we can. You can order now and it’ll ship as soon as Amazon gets it entered into the system. 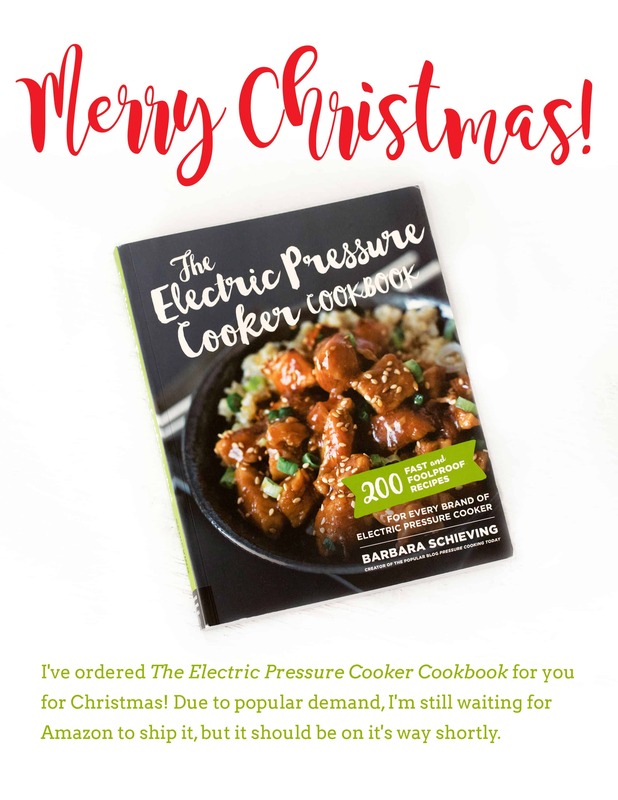 If you have been planning to give The Electric Pressure Cooker Cookbook as a Christmas gift and won’t receive your cookbook, I have created a little “gift letter” printable you can gift to your loved ones on Christmas day. I will keep you updated on our progress and let you know as soon as the new copies of the book are available. Thanks so much for your patience and support! I promise, it’s worth the wait! Someone mentioned on the Pressure Cooking Fun Facebook Site that there was a list of minor errors in Barbara’s latest cookbook. The cookbook is wonderful but I can’t find the list of “oops items” on the website. Can you help? Hi Barbara! I worked with your daughter, Jenn, while we were in college. I posted on Facebook that I got an Instant Pot and she linked me to your cookbook so I just bought one on Amazon! I’m hoping that it’ll be back in stock soon and am looking forward to your recipes! Hi Stephanie! The cookbooks should be available very soon – Amazon has received the second printing and they just need to get them into their distribution system and start shipping. Have fun! The cookbook is currently available online at Walmart https://www.walmart.com/ip/Electric-Pressure-Cooker-Cookbook-200-Fast-and-Foolproof-Recipes-for-Every-Brand-of-Electric-Pressure-Cooker/56102325 and Barnes and Noble https://www.barnesandnoble.com/w/the-electric-pressure-cooker-cookbook-barbara-schieving/1127144755?ean=9781558328969#/ and if you prefer to order it on Amazon, you can order it now and it will ship as soon as they update their distribution system https://www.amazon.com/Electric-Pressure-Cooker-Cookbook-Foolproof/dp/1558328963/ref=sr_1_1?ie=UTF8&qid=1510177838&sr=8-1&keywords=barbara+schieving Have fun! I ordered one on Nov 19th and I’ve been checking every morning to see if it was in yet. I just read your update and went straight to Amazon to see if mine was on it’s way and it is! 😀 I will get mine Friday. I am so excited! My Christmas will be early this year! I love your recipes and always know if I used one they will turn out great! I got mine early and love, love this cookbook. Have made several recipes and all easy peasy and delicious. I was one of the lucky ones in the first 19 days! Thank you for all the wonderful recipes and tutorials! Merry Christmas! Merry Christmas Penny! Have fun 🙂 Thanks! So happy for your success. Hi – i ORDERED 3 FROM AMAZON, ALL AT THE SAME TIME. 2 SHIPPED YESTERDAY, SO WE SHALL SEE! Thanks for sharing Kathy – so weird that they would just ship two. Like the others, I appreciate your dedication to your followers – we appreciate the updates. Do you know if they lower the price to the current price when they eventually ship the book? Thanks LeAnn – I believe it’s Amazon’s policy to offer you the lowest price when it eventually ships. Thank you for the update on the cookbook. I know there’s nothing you can do, but greatly appreciate the fact you let us all know, to the best of your knowledge, what the current status is! I will look forward to getting it, whenever it ships! Happy Holidays! Thank you for this printable! Thanks for ordering the cookbook Angela! !